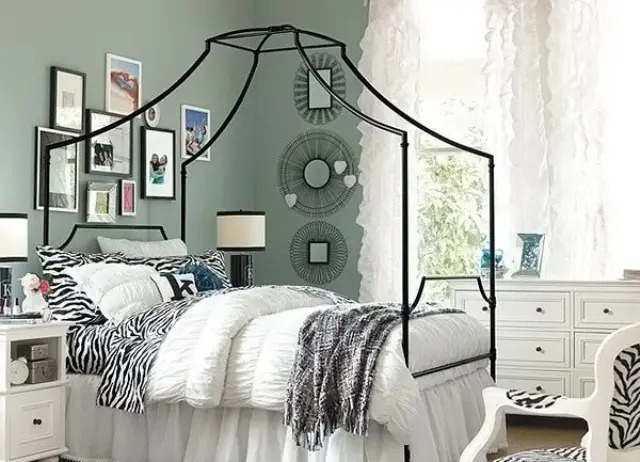 Decorating a bedroom for your teenage daughter or daughters may be a little tricky because she has grown up, she doesn’t need all these toys anymore and she often wants to feel adult and sees her room as an adult one but still some cute touches should be there, too. 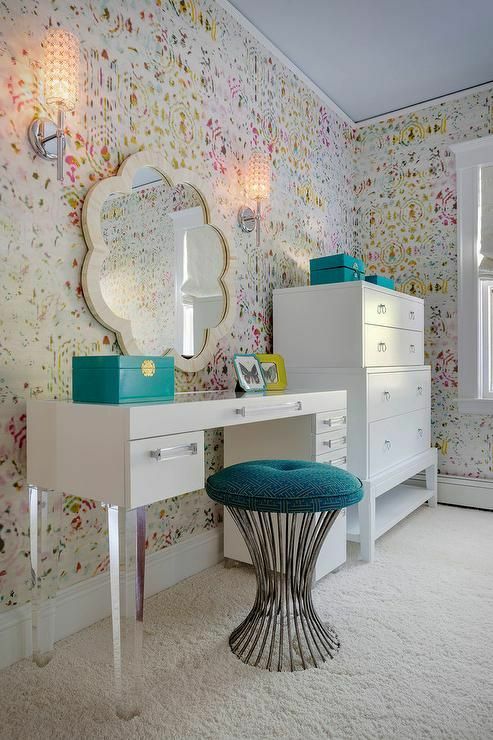 A teen girl room should have several areas organized a lot of functionality: a sleeping zone, a studying zone, a vanity and a closet if necessary, and maybe an area for guests. 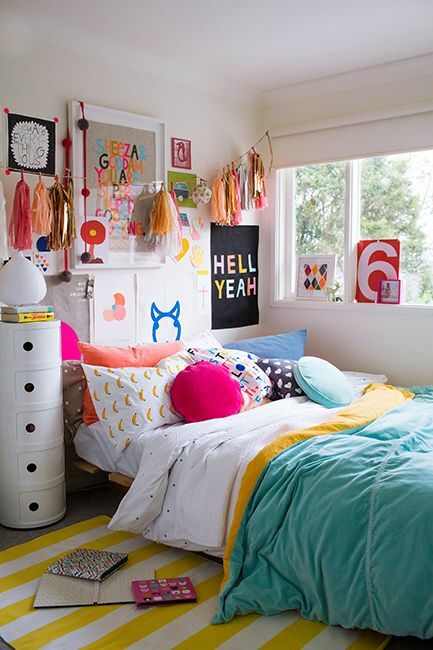 Separate the areas to give your girl more comfort and organize them to make them more practical. 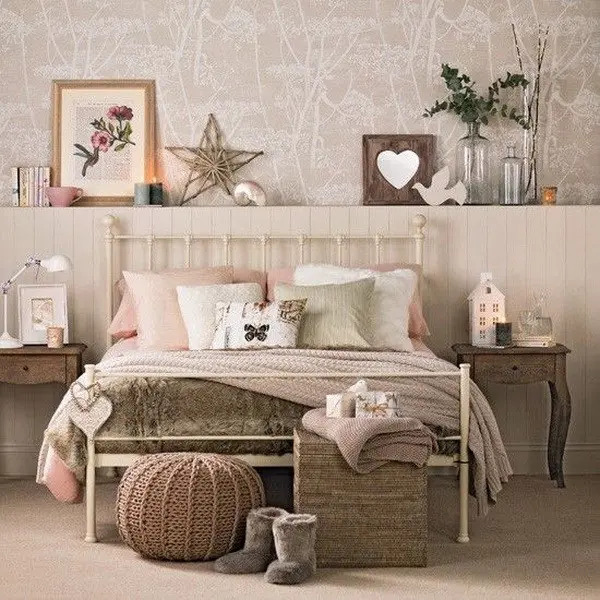 Highlight the sleeping zone somehow, for example, place the bed on a wooden podium to separate it from the rest of the room, or choose a canopy bed or a bed with several draperies to keep privacy and make it more relaxing, especially if it’s a shared room. 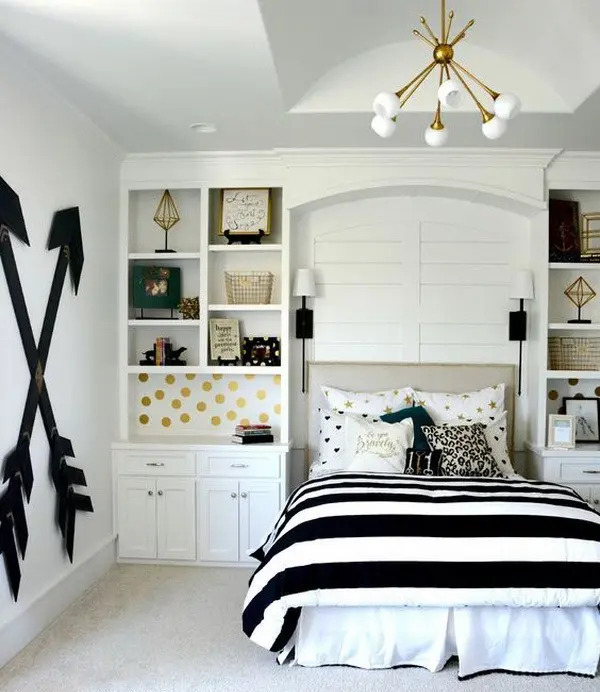 Add storage cabinets on the sides of the bed or go for curtains to separate this part of the room. 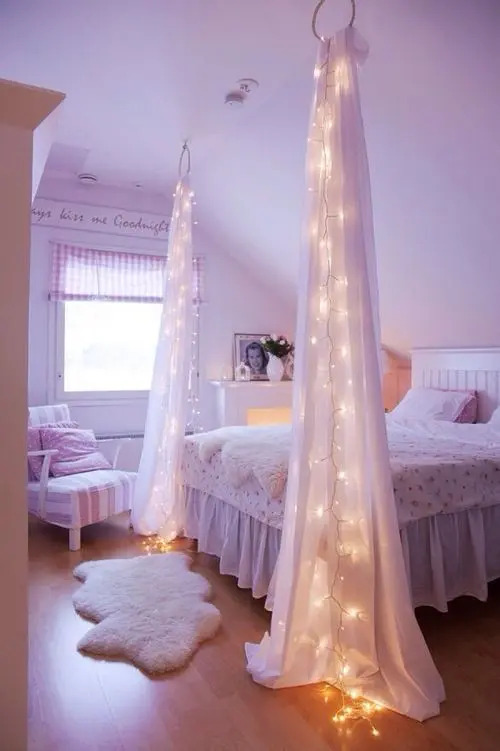 Another cool idea is placing the bed by the window creating a wonderful sleeping nook, so your girl can see stars. This works, of course, only in the case it’s safe and private enough. Your girl will add LEDs, photos, pictures and other stuff she wants in her sleeping nook to make it cozier. 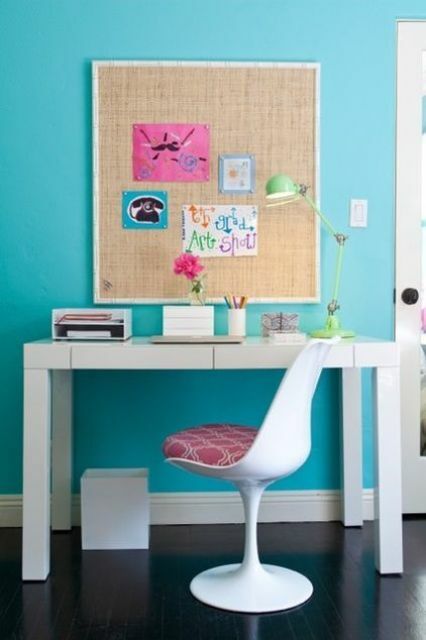 A study zone is another important space for any kids’ or teen room as your girl or girls need to study well, so organize this space in an inspiring way. 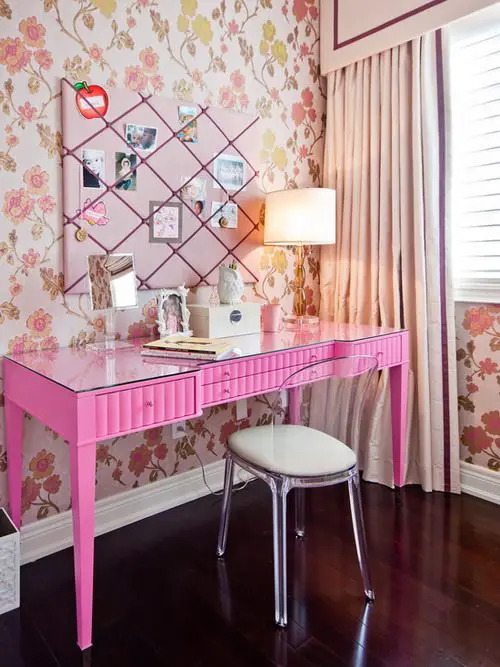 Make it girlish: go for a cute desk, bold pictures or photos, make a gallery wall, add a fur cover to the chair and some little glam accessories that she will like. 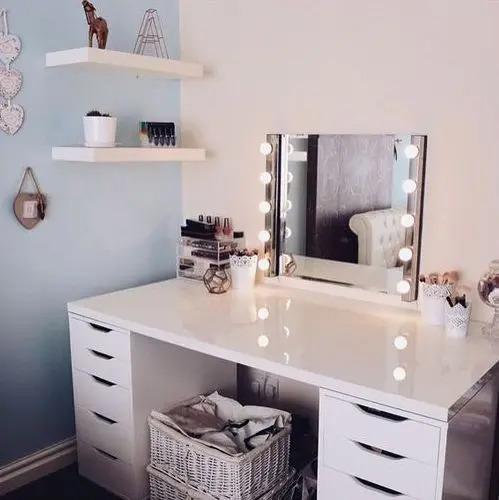 Don’t forget that storage is important: choose desks with drawers, hang open shelves and place cabinets if the space allows. 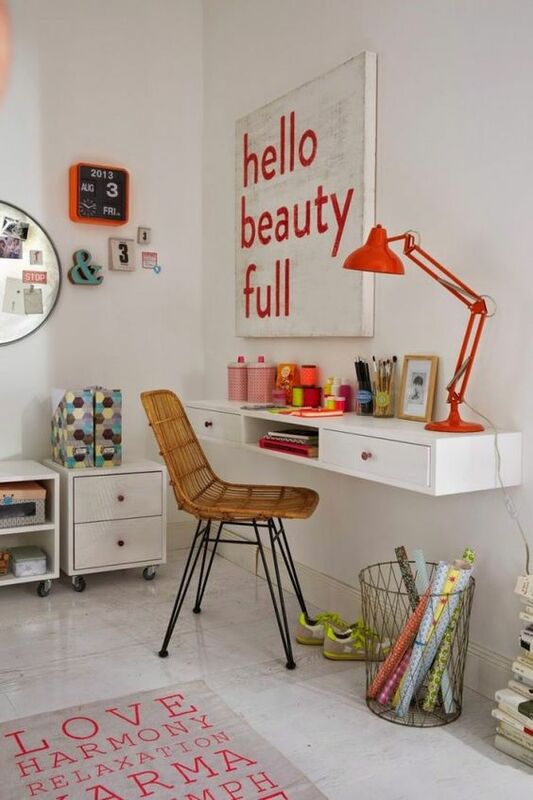 If the room is tiny, go for a wall-mounted desk with drawers and a pegboard or a pinboard to solve the problem of lack of space. 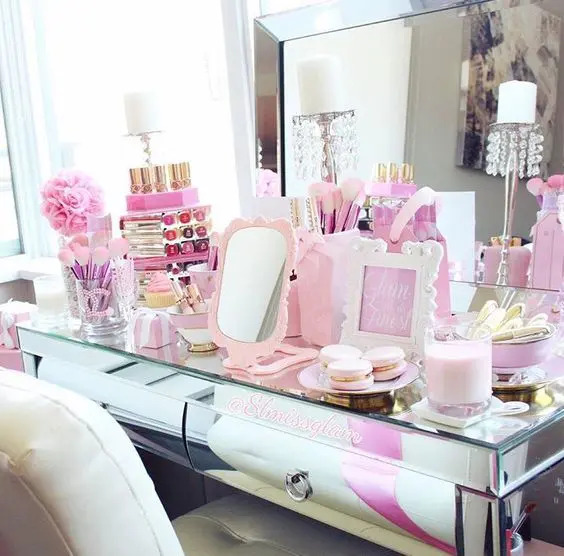 All girls use makeup and your daughter definitely needs some space to store all her makeup, nail polishes and other stuff and to apply them all there. 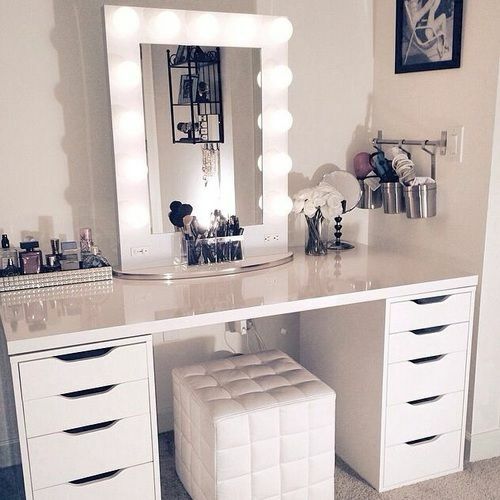 Make her feel a star turning a usual desk into a vanity and adding lights to the mirror. 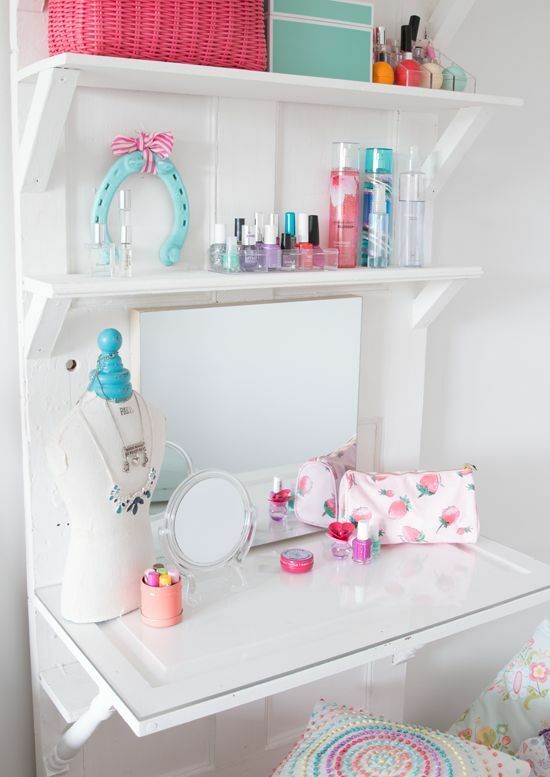 If a vanity doesn’t have any drawers, you’ll need to hang some shelves or attach them somewhere around the vanity. 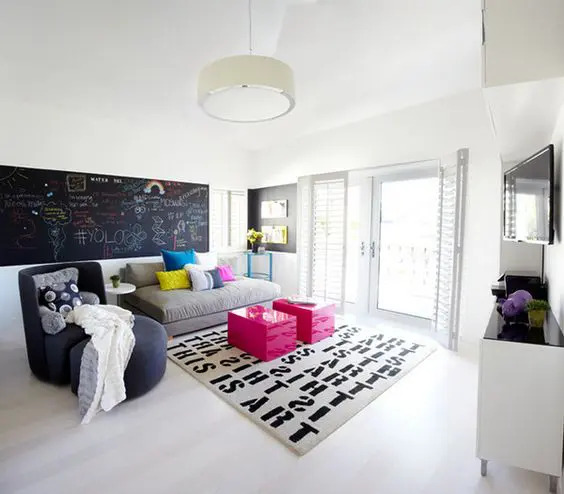 There are foldable and wall-mounted solutions for small rooms, and you can easily create some yourself. Clothes is another passion of teen girls, let your daughter store them and her shoes in the best way possible. 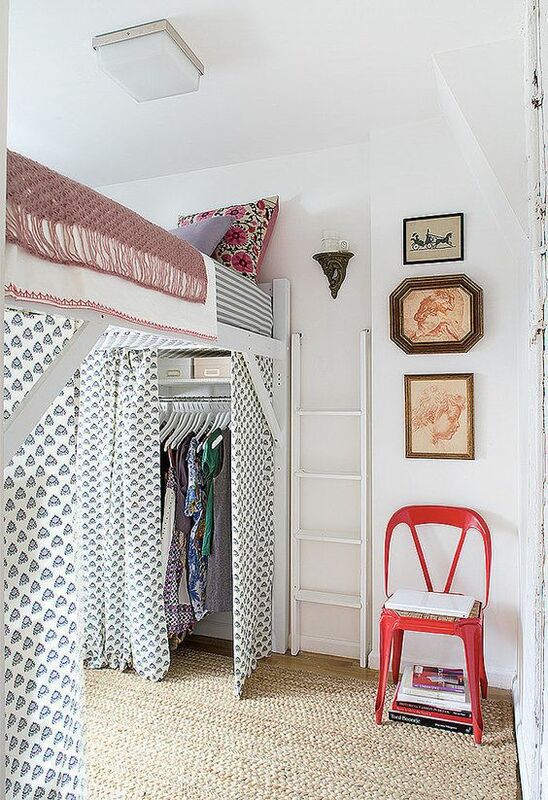 If you have enough space, you can make a separate small walk-in closet as a part of the room. If not, there are a lot of solutions: built-in wardrobes, under the bed closets, in-wall closets and so on. Make shelves to display her shoes and some cabinet for lingerie. Here almost everything depends on the space you dispose, so consider it and your girl’s wishes. Hangouts are loved by everybody including your teen girl! 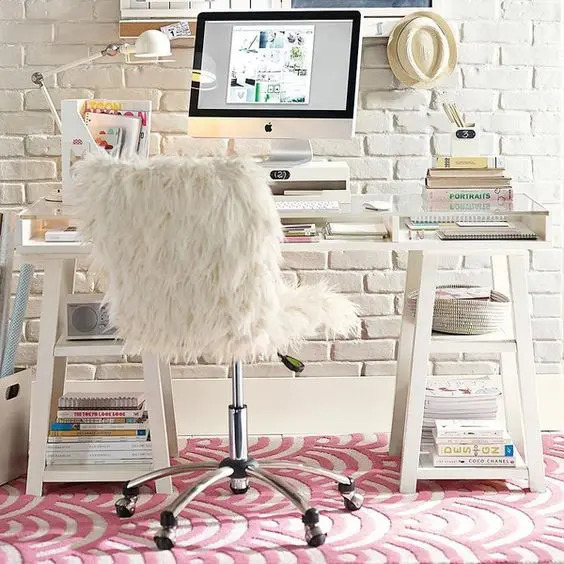 So make a hangout nook or even a large space if you have such an opportunity. 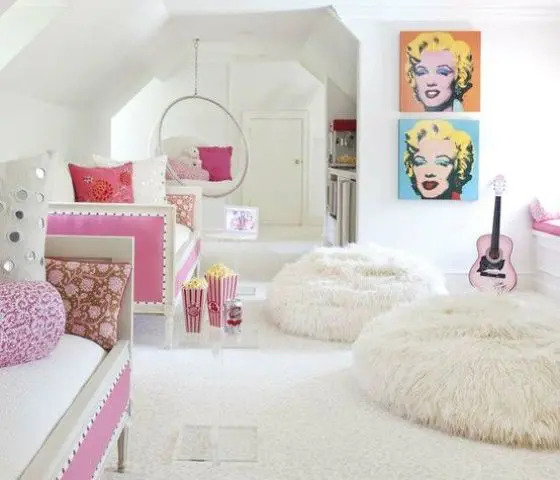 Place a couple of large soft beanbag chairs, or some transparent hanging ones, add a TV, some graphic rug, a pink sofa and voila, your girl can invite friends to hang out!